I vote no! Look, I have been playing deande a lot and I love it when I crit someone with burst dash. I use a more tanky loadout and don’t have the extra shield to make it ridiculous but it is still absurd. I can stay in lane longer than most melee characters with my loadout do more damage and get a lucky OHK on occasion. She also has one of the best escapes in the game, an attack cadence that makes her very hard to hit, a team stun ultimate that can setup multikills. Gah! Sorry! I’ve said too much. Heh, I actually don’t play Paladins, nor have I played a single CoD. As for Overwatch, I either play as a support, DVa, or Sombra. When it comes to high burst damage characters in other games, I rarely touch them. I know exactly who I made that response to, the one I asked for help on how to get better with deande and got some great advice. Everyone likes to complain about other characters that deal large amounts of burst damage but not the one that can OHK squishes twice a minute? I can be top damage, minions killed, players killed and take tank like damage, she does not need the OHK. There, i said it! now tell the DHC to give me my kippers back! I have a statistical analysis for why this is largely an inaccuracy for the majority of applicable situations. But this is bad for my health. Check my new forum tag. @Phoenix-2613 fix it for me. I tire. This may work in pubs, but this is completely unviable if your enemies have any decent coordination. If I take a build and loadout like this into any game in our scrims I would be target banned every match. Not by the enemy, but by my own captain. If you want a brawler, then play someone else like Attikus or El Dragon, Deande isn’t the right girl for that and I don’t want her to become just a worse version of those. Can people please play her a little more often before calling nerfs? That crazy OHKO twice a minute is nothing you pull off just like that, especially when you are e.g., playing on US servers as EU player. I’ve played enough games where I couldn’t do anything because a Rath, El Dragon, etc. on the enemy team knew what they were doing and took any chance for me to get in position for anything else than throwing fans. Removing crits from burst dash also would make her pretty garbage for PvE and it would be really nice if we could stop the trend to make it less fun with every balance patch. Stack shield and skill damage gear in order to get the highest damage possible. Pick certain helices to further increase her damage. Get in close to the enemy team, sometimes making dives, which can leave her vulnerable. Use up one of her escape skills to proc her EOS passive, which leaves her solely relying on Jump Kick to escape. Be stripped of her shields, due to Calculated Risk, adding to her vulnerability even more. Have a good aim in order to score an actual crit with Burst Dash, which is somewhat difficult to achieve on characters that aren’t Miko or Orendi, (and to some degree Ambra), IMO. …in order to OHK, I think doing all of the above should be rewarded with said damage. Besides, the OHK only applies to the squishy-est of squishy characters; everyone else can at least survive the initial Burst Dash. The OHK in itself is very situational, it requires a lot of input from Deande, and skill from the player. Missing your Burst Dash leaves Deande in a really bad spot too because she is only a squishy character herself; all it takes is a little bit of CC and she’s as good as dead. She can be quite easily countered if you know how, but I don’t want to ramble on as her level 4 helix perfectly sums up my argument; high risk, high reward. Why would the DHC have your kippers? We have no need for fish. So you’re not going to give them back?! So now I’ve changed my mind. The list of people you want to be flipper-friends with?! Wait… Is this another attempt to make me cry, because @Rabid_Explosions said that Finisci tears grant immortality…? I said whuuuut? I’ve always preached about how Finisci tears were great sexual lubricants…but I guess immortality is pretty neat too, I guess. Who needs Finisci tears when you’re sustained? I’m sorry, but the Jennerit have already beaten you in unlocking the secrets to immortality. Finally this dwarf gets what he deserves. 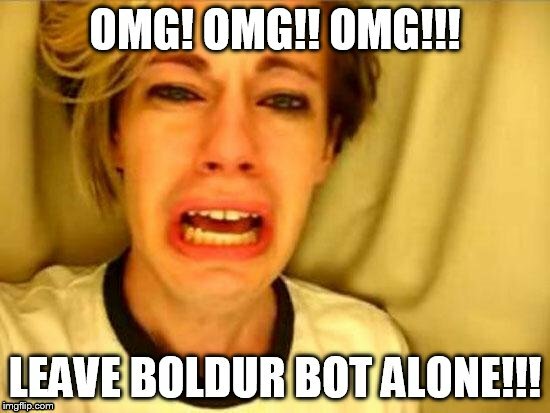 What about Boldur bot? Is he still unable to attack? I dunno… I’ve found him to be annoying. Ernest has always been more my style. Assassin Ernest that is.